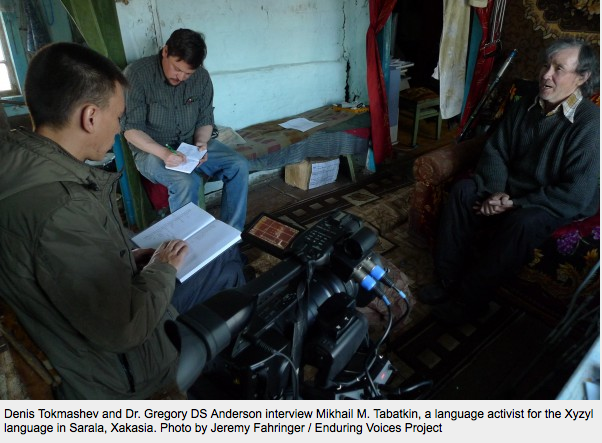 “The 2012 Enduring Voices expedition to the Siberia Language Hotspot has allowed us to explore the current state of the Xyzyl (pronounced hizzle) language from the Republic of Xakasia (pronounced ha-KAH-see-ya, also spelled “Khakasiya”). We traveled across the birch-covered hills of southern Siberia and into the wind-swept steppe dotted with ancient burial mounds until we reached the Xyzyl territory northwest of Mongolia. We visited five villages and identified fifty to sixty total speakers and semi-speakers. For the rest of Dr. Anderson’s article, please check out right here on Nat Geo NewsWatch. This entry was posted in Endangered Language Activism, Enduring Voices Project, Gregory D. S. Anderson, Indigenous Language Activists, Media and Publicity, Support Endangered Languages and tagged endangered languages, enduring voices, indigenous, living tongues, national geographic, research, siberia, xyzyl by livingtongues. Bookmark the permalink.